If you are like most people around the globe, you have heard or already seen the new Beauty and the Beast film! It is getting rave reviews at the box office, and taking the world by storm! It is a beautiful live-action remake of the classic Disney animated movie! My daughter Hailee saw the movie over March Break with her Grandma and has not stopped talking about it. Hopefully within the next few weeks I can squeeze in some time and drag the better half out for a sappy date night to see it! It is really hard to pick a favourite Disney movie, I mean how can you, but Beauty and the Beast is pretty far up the top of my list. I can remember as a little girl watching the movie. One of my favourite parts, that still to this day makes me sing and smile, is the “be our guest, be our guest” scene! Bella is totally into watching all the Disney movies and playing with many of her sisters old Disney toys. I am happy that I kept so many of my daughters’ things. We recently took Bella to Disney on Ice where there were some amazing scenes from Beauty and the Beast. She was impossible to keep seated. Her excitement and high-pitched screams for Belle were absolutely adorable. She talked about Belle for days after the show and wanted to go back to see her. We recently teamed up with Toys R Us to check out some of the new Disney’s Beauty and the Beast toys from the new live-action movie! Needless to say when the package arrived Bella lost her mind. She couldn’t wait to get her little hands on all the toys, secretly neither could I. 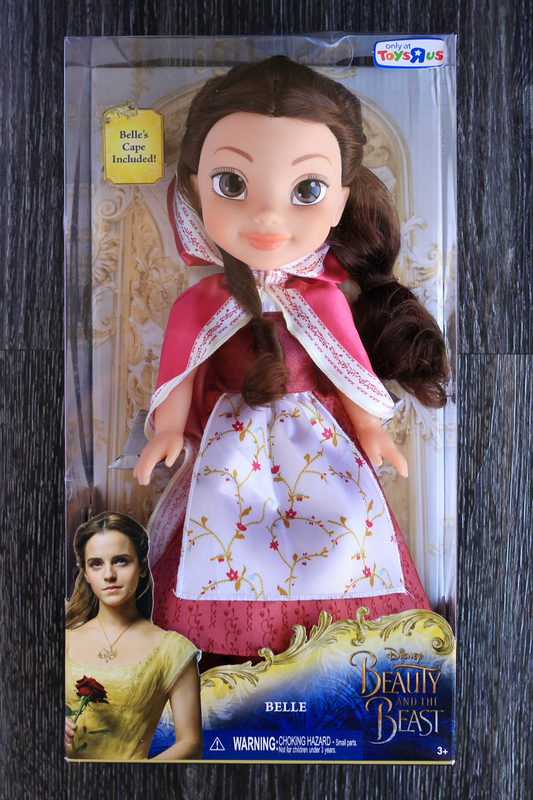 This 14″ Disney’s Beauty and the Beast Belle Red Dress/Cape doll is dressed in the iconic cape, as seen in the movie. You will find her in Bella’s grocery cart; they often “shop” to feed the Beast! The Disney’s Beauty and the Beast Grand Romance is such a classic set. It comes with both Belle and Beast. Bella has had so much fun creating her own scenes for Belle and the Beast! 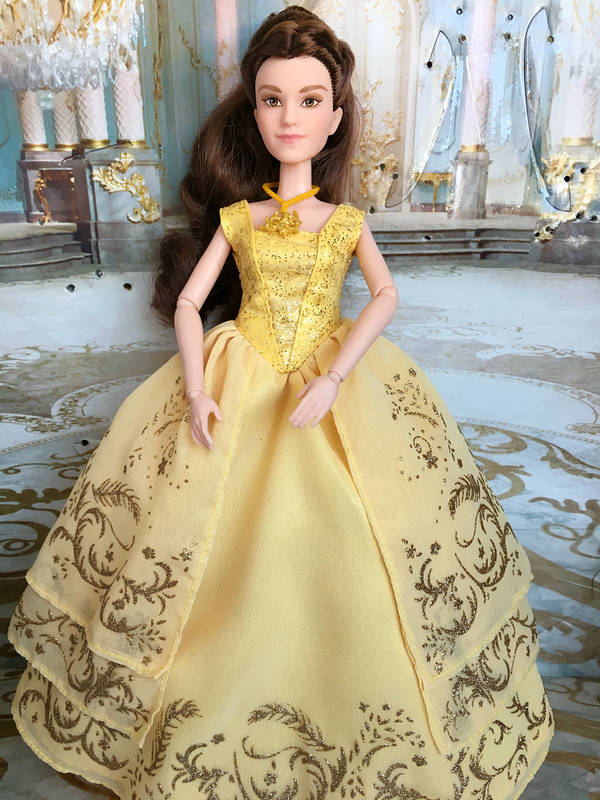 If you are a fan of the classic ball gown that Belle wears, you will absolutely love this doll. It is such a beautiful dress and the detail is amazing! The Disney’s Enchanting Ball Gown Belle doll does come with a hair piece, necklace, and removable shoes! I know I would have loved this doll as a child! Have a little girl who wants to be Belle? I may or may not have had to bribe Bella to take it off to sleep. Seriously, she has transformed into Belle. I catch her twirling as she watches herself in the mirror. Disney’s Beauty and the Beast Belle’s Ball Gown fits size 4-6x. While it is a little loose on top for Bella, a quick tie at the back with string fixed that. She will be wearing this gown for years to come and quite possibly this Halloween! While I remember, my middle daughter Hailee had a complete meltdown when she was younger. Why you ask? Because I did not name her Belle! I wish I still had the video. She was so serious and so mad at me. “Call me Belle, my name is not Hailee”. To which I responded, I am sorry Hailee, I named you Hailee and that is your name. She cried and yelled out “I am changing my name to Belle, you will call me Belle”. It was adorably heartbreaking to see how much she loved Belle and she still does to this day! Bella has been enjoying the Disney’s Beauty and the Beast Belle’s Dress Up Accessories Set. It is a really beautiful accessory set, inspired by the movie, that pairs perfectly with the Belle’s Ball Gown. 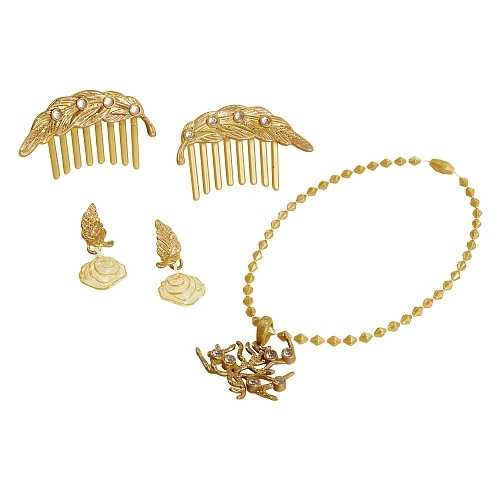 The set includes: two feather hair combs with jeweled details, a pair of rose earrings and the iconic tree of life pendant necklace. We can’t forget the enchanted rose, can we? 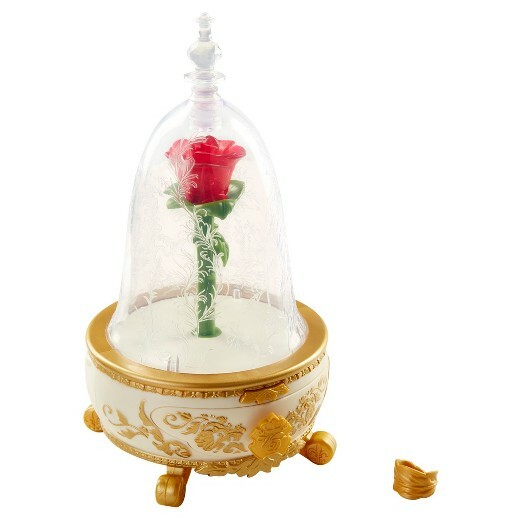 The Disney’s Beauty and the Beast Enchanted Rose Jewelry Box is a perfect place for Bella to store her treasures. She loves that it plays songs from the movie and lights up when she opens and closes it. We may need to invest in some batteries. I have a feeling it won’t be long before she wears them out! 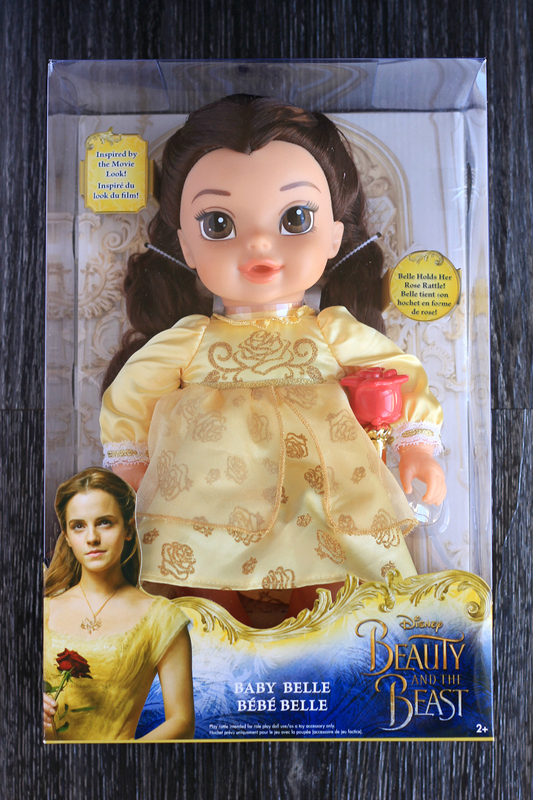 How adorable is this Disney’s Beauty and the Beast Baby Belle doll? Bella loves dolls and she has a soft body perfect for cuddling! 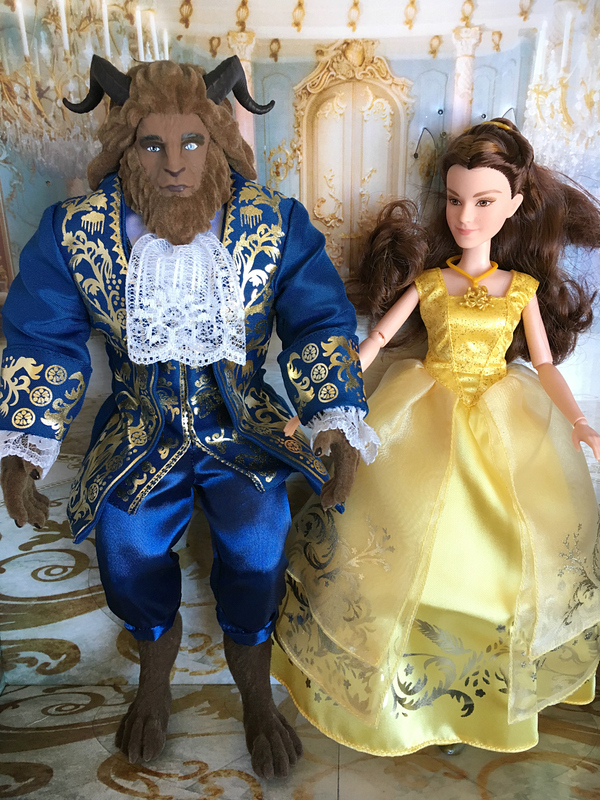 It is a great doll for the younger Beauty and the Beast fans. Again, the detailing on the dresses of the dolls is incredible. She also has a sweet rose rattle she holds. I have to say, the Disney’s Beauty and the Beast Castle Friends Collection is my fave. I can’t even begin to describe how amazing these little figures are. The detailing on the is remarkable. 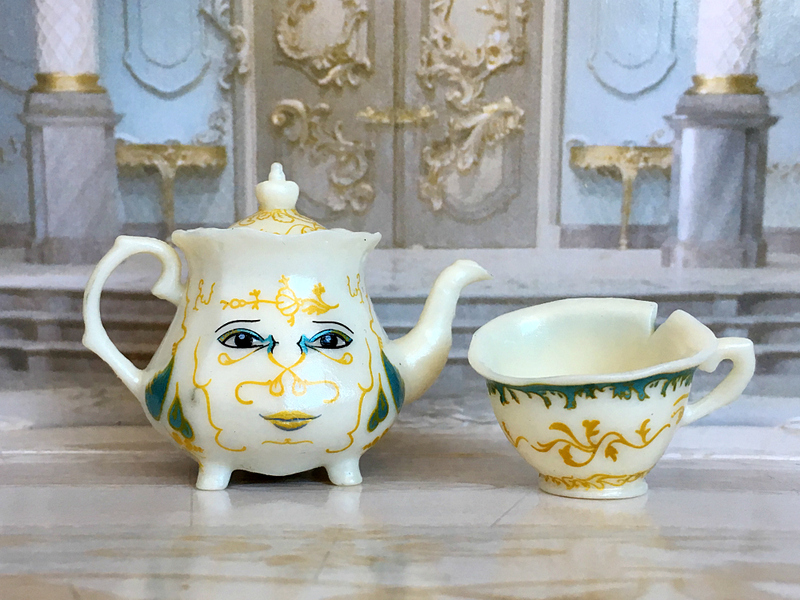 This adorable set features some of the most loved characters from the live-action movie, including Chip, Mrs. Potts, Cogsworth, Lumiere, and Plumette. 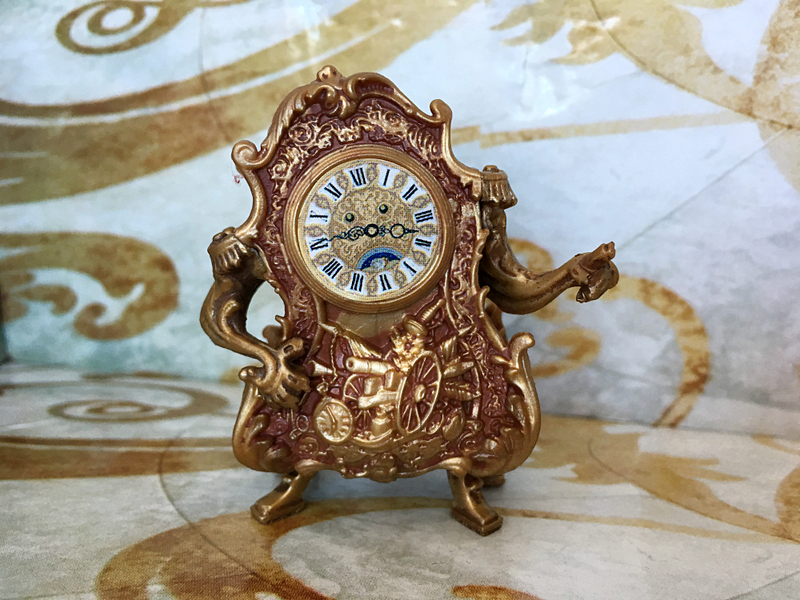 Look at the detail on Cogsworth, incredible! I kind of want him for myself, do you think Bella would notice? These are Bella’s favourites out of the Castle Friends Collection. She carries them in her little purse everywhere with her. 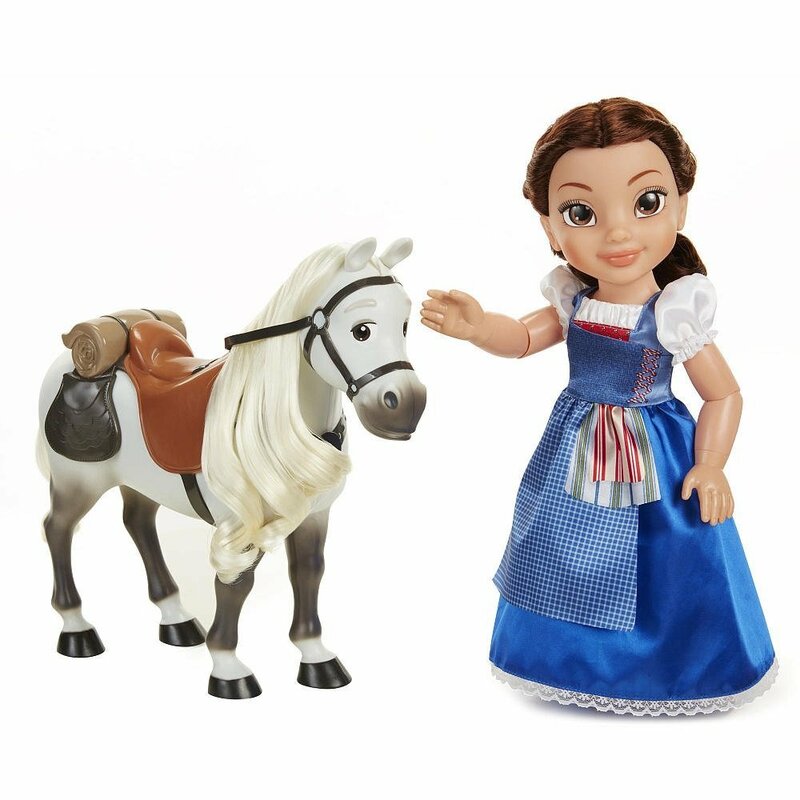 Head over to Toys R Us to check out all the amazing new Disney’s Beauty and the Beast toys. 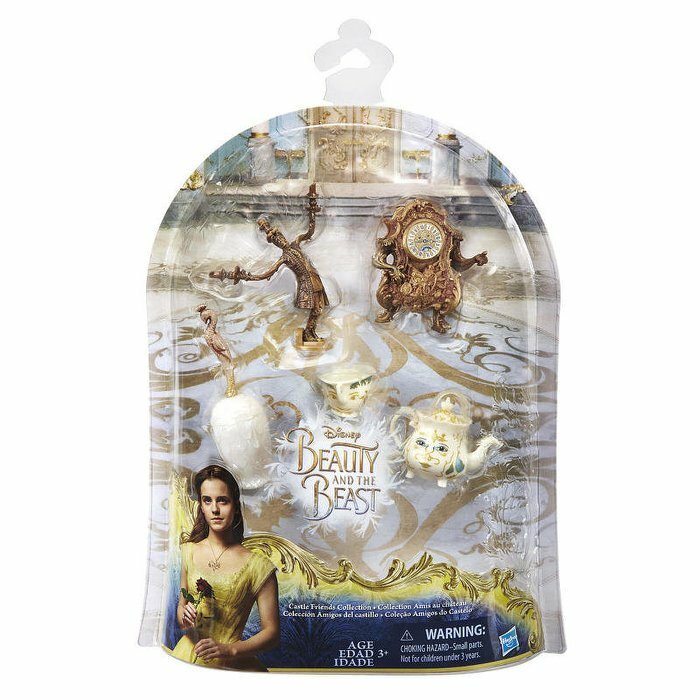 As a special offer, receive 15% off of your total purchase on Beauty and the Beast Live Action Movie products. Enter coupon code BATB10 at checkout! Discount may only be applied once. Offer is valid on regular priced product only. This offer cannot be used in conjunction with any other coupon or savings offer. Discount is valid online only. Offer valid from February 20 – April 30, 2017. 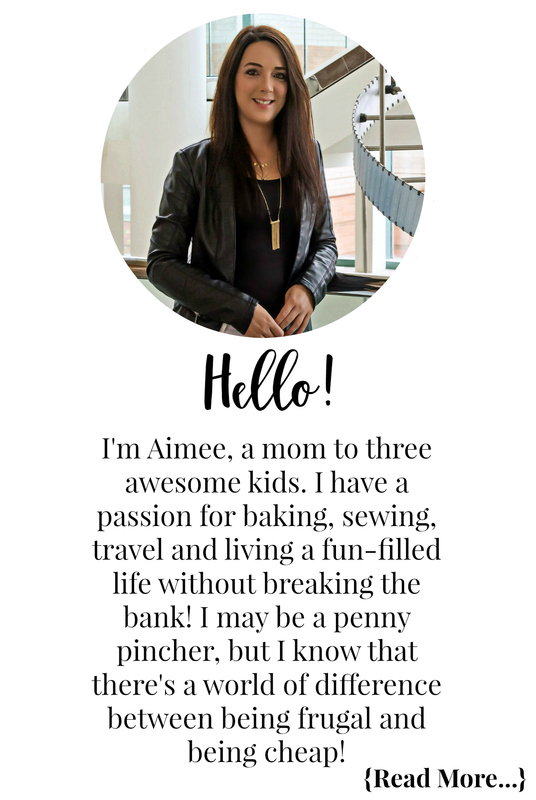 I have teamed up with Toys R Us Canada to offer this amazing giveaway to the Extreme Couponing Mom readers. One lucky winner will win a Disney’s Beauty and the Beast Belle and Philippe toy valued at $80! Use the form below to enter. Entries are verified prior to drawing a winner. A winner will be randomly drawn on April 21, 2017. The winner will be contacted via email and will have 24 hours to respond. Disclosure: Although this post has been sponsored by Toys R Us Canada and we were sent product for review consideration, the opinions and language are all my own, and in no way do they reflect Toys R Us Canada. Any product claim, statistic, quote or other representation about a product or service should be verified with the manufacturer, company, provider or party in question. The Lion King is my favorite Disney vie but Beauty and the Beast is a close 2nd! My favourite Disney movie for sure! Saw it in theatre with my Childhood bestie last night, and it did not disappointed – casting was perfect! So excited to see the live action version. I love beauty and the beast. I think my daughter would really like to see it too. I am so excited for the movie! Thank you for the wonderful giveaway. Beauty and the beast….all time favorite disney movie! My daughter absolutely LOVED the movie and she is already making her list for Santa! Looking forward to seeing the movie! Loved Beauty and the Beast when I was growing up. Loved the movie! Saw it with my sister and our babies at Stars and Strollers, we all loved it! My favorite is Beauty and the Beast. I am looking forward to seeing this version. 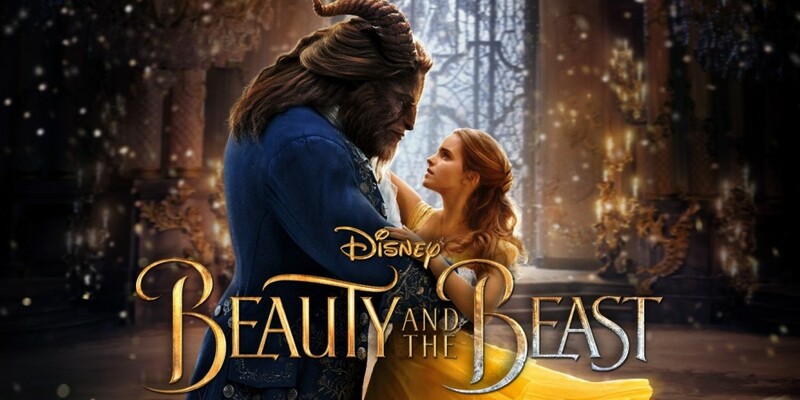 Beauty & the Beast is my favourite Disney movie – love the characters and the music! My favourite scene is the winter scene when Belle and the Beast are playing outside in the snow. Right now my favourite Disney movie is Pete’s Dragon!! Aristocats is being played a lot here right now. My all time favorite Disney movie is Cinderella! I just think it is so perfect! Benji is my all time favorite Disney movie. Ok mine is Cinderella, my daughters is A 3 way tie between Frozen, Beauty & The Beast and Sleeping Beauty! My favorite is Sleeping Beauty. My favourite Disney movie is Lady and the Tramp. I loved Snow White and Lion King as my two favorites. As a gear-head, my favourite Disney movie is the ‘Cars’ franchise. I was amazed they were able to get seven-time Formula 1 champion Michael Schumacher to do a voice. My favourite is 101 Dalmatians. My favorite Disney movie is the Lion King! My favourite Disney movie is Moana, it is so great! MY favourite Disney movie is Lion King and Toy Story series. My all time favorite Disney movie is Beauty and The Beast.I am excited to see the new version but just love the theme,music, costumes,characters and the great moral to the story! My favorite Disney movie is The Loin King movies. Hard to choose just one favourite Disney movie. I really love the Cars and Planes movies as all my kids will watch them. My personal favourite is the Lion King although Beauty and the Beast and the Little Mermaid are right up there too! Beauty and the Beast is my favourite Disney movie with The Little Mermaid being a close second! I love so many! The original Beauty and the Beast and The Little Mermaid are just some of them. Funny enough, my favourite Disney movie has to be Beauty and the Beast! It was my favourite growing up, and the new movie is absolutely spectacular! My fav is probably the aristocats.. but you can’t go wrong with any Disney movie! Not a cartoon, but I always loved Escape to Witch Mountain when I was a kid. My favourite disney movie has always been Sleeping Beauty. My favorite Disney movie is Mary Poppins. The first movie I went to with my grandma. My favourite movie is The Little Mermaid. My favorite Disney movie is Tangled..
We are going to see Beauty and the Beast tonight but so far my favourite movie is Tangled. My favourite Disney Movie is The Lion King, but Beauty and the Beast is a close second. Toy Story is my favourite Disney movie. My favourite is Beauty and the Beast. I also love Lion King as well! The little mermaid is my favourite! A childhood favourite and now I am able to share it with my daughter! Can’t wait to see the new Beauty and the Beast! my fave disney movie is Little Mermaid. I love Ariel! My favourite Disney movie is Sleeping Beauty! My favourite Disney movie is bedknobs and Broomsticks ! Thanks for the chance to win. Love your tips! I’ve always loved Aladdin – even more now that Robin Williams is gone. My favourite is Little Mermaid! My fav is the AristroCats but I love Fox & the Hound, Bambi, Lady & The Tramp & Robin Hood too! Monster Inc. is my favourite Disney movie. Cinderella is one of my fave Disney movies. The Little Mermaid is my favourite. Beauty and the beast has always been my favorite movie! And now it’s my daughter’s fav!!! Love ❤️ Beauty and the Beast. My niece would love this!!!! She is a true girly girl and this is fantastic!!! Would love to be the fav aunt! oops, it posted! My favourite movie is Jungle Book but mu niece loves Beauty and the Beast! My daugther absolutly loves this Movie! She is 3 and she says she is a princess and her dad is her prince! Beauty and the beast is our favourite movie of all time. Only way my daughter will sleep at night is if we play the sound track. Thank you so much for the chance. My all time favourite Disney movie is The Little Mermaid! What an amazing giveaway . Thank you for the chance ! Only a few hours left! Fingers crossed!